I like all kinds of holidays and celebrations. New Year and my birthday are two my favorite occasions and I always try to get the most of them. For the New Year 2011 my friends and I had a party at our place. It wasn’t too big or loud but it was warm and joyful, with good food, great drinks and a pleasant (at least for me – can’t vouch for everybody else) gifts exchange. It was a wonderful night; I wore one of my favorite perfumes, was very happy and felt great. Next morni afternoon I woke up really sick with flu. It was the worst sickness I had in many years. I felt awful and had no strength to get out of the bed for a couple of days. In my feverish mind there were two recurring thoughts to which I tried to hold on as if it was really important to keep thinking them. First – I was very glad and thankful to all the forces of the Universe that I hadn’t got sick 24 hours earlier: it would have been a complete disaster for our party and everybody involved. And second – I was happy that by the time I woke up my new perfumed love (Ormonde Jayne’s Ta’if) was already gone: I was dreading to associate the scent I cherished with the misery of that day. So while feeling horrible I felt lucky. When I finally forced myself to get up and start moving, I noticed a wonderful smell coming from my bathrobe’s collar. It wasn’t too strong or persistent, I would catch a whiff of it now and then, but it was so unexpectedly comforting and supporting that I almost cried. With all the testing I had been conducting at the time it took me a while to figure out what perfume it was. 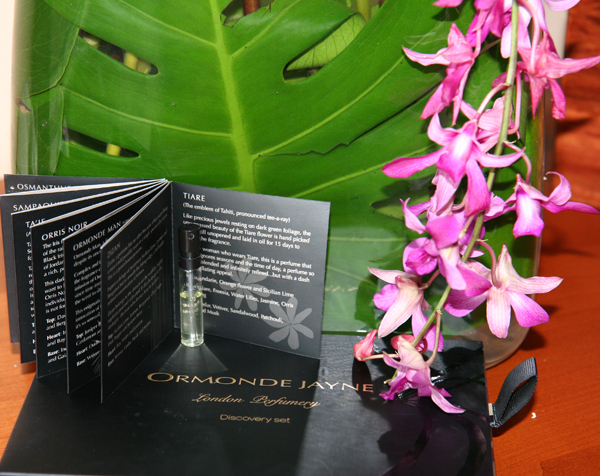 Tiare by Ormonde Jayne.